POST UPDATE : GOOD NEWS ! - we added in Money Robot a huge number of proxies (they are embedded in MR, you can activate the MR proxies from > Settings > Proxy tab) MR proxies are free and HMA is not needed anymore ! you can continue to read the post if you still prefer to use HMA software. 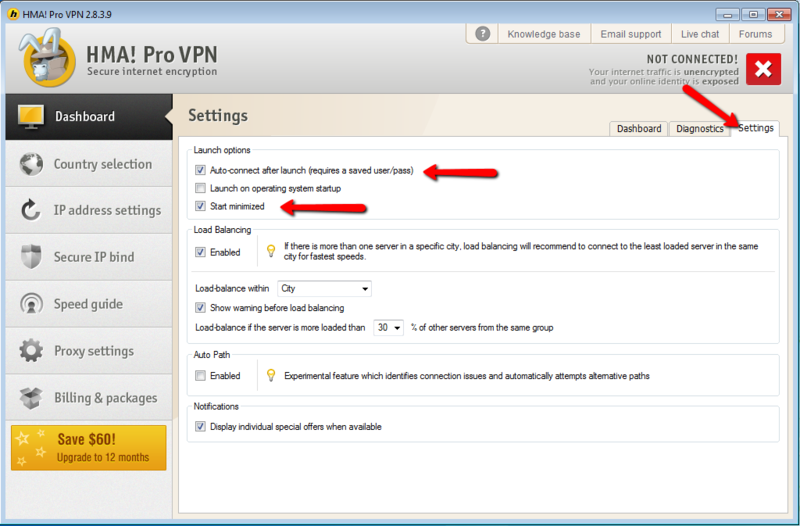 Hi Guys, this is a small tutorial about how to configure HMA to work properly with Money Robot, if you don't have hma installed already here you can see the HMA vpn installation tutorial . First step is the inserting of the username and password of your hma account, then make sure you will activate the feature "Remember my username and password" this feature is important to be activated. The next step is activating of "Auto-connect after launch (require a saved user/pass)" and it is recommended also to activate the "Start minimized" feature. Now the Money Robot Software is able to manage and communicate with the HMA vpn Software, and it will send change ip commands to HMA every time Money Robot will need a new IP (every time a task will end). This will make each account creation to be created each time from different IPs. Some sites will allow only one account created from the same ip in 24 hours, so HMA will be very useful to provide higher success rate on account creation process. Please make sure you will also activate the feature from the Money Robot software , from the Settings > "Automatically change IP after each task ends (Require HMA Software)" , this feature will monitor and control the HMA. Here is the checkbox that needs to be activated. This is all the process needed to get new Ip for each account creation. 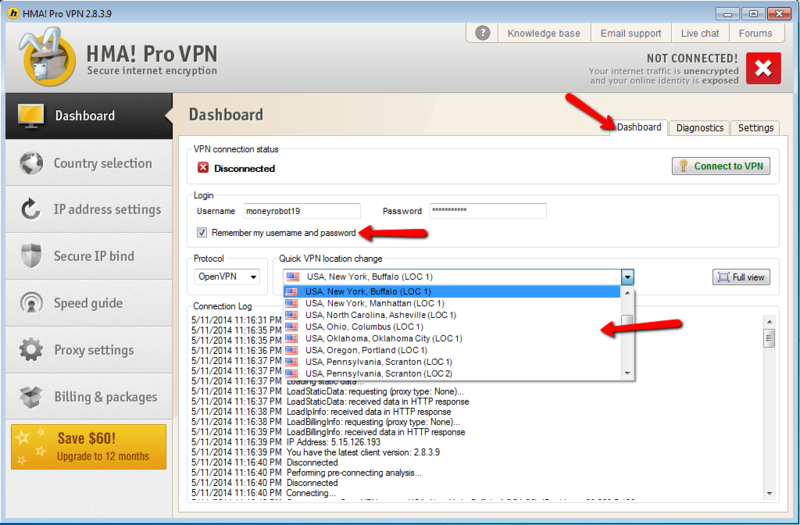 Hi Nick, you recommend HMA VPN software or dedicated proxies ? I think HMA is better but I just want to know your recommendation, thanks. Dedicated proxies can be faster then HMA sometimes but we recommend HMA software because of two reasons, it have many ip's, at this moment HMA vpn software have over 74000 IPs and it will probable go to over 100000 ip's in next months, and the second reason is the price, hma software price is $11 per month and usually at this link you may get a discount (http://hma.moneyrobot.com) af. redirection, and if you purchase proxies for the same price you will get about 10-11 proxies (ip's) only. Thank you Nick for fast reply to the post, I now fully understand the difference, I will go for HMA and I will configure it like in your above tutorial, I will ask you on skype if I will need more help. thanks again !